At 10 days of Japanese fun, it was time for our time in Tokyo to come to an end! There are a few little stories we want to share before we start blogging about our adventures in Hong Kong!! 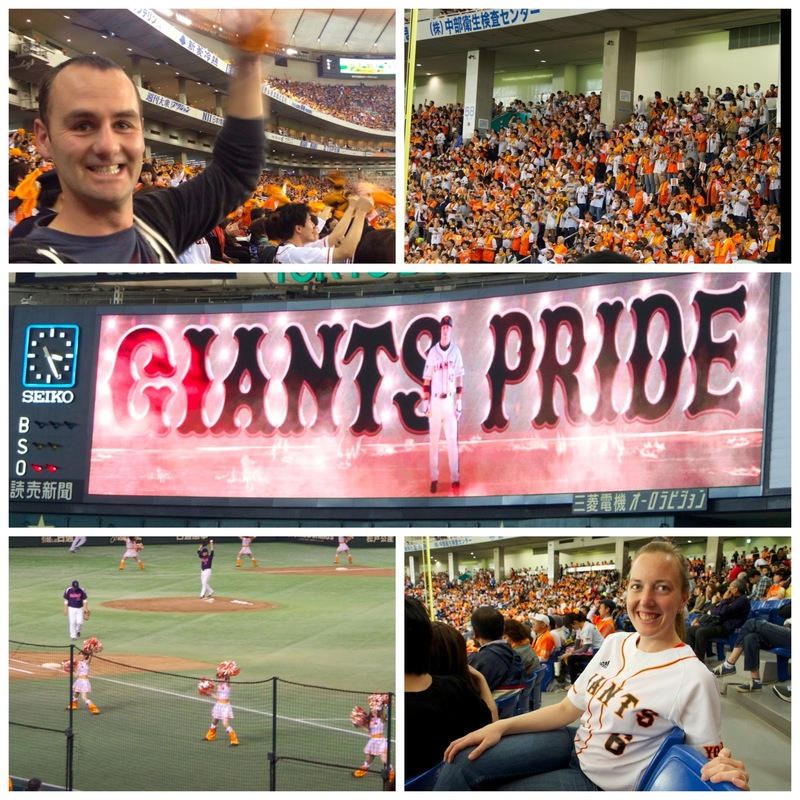 For our last full day in Tokyo, we went to a Giants baseball game (yes, like the San Francisco Giants!). The team was modeled after the Giants (in NY then), with the same logo design, team colors, and awesome fan base. And going to the baseball game in Tokyo was a fabulous experience! We bought our tickets at a machine in a 7-11, but the machine does not have english translation, so we asked the clerk at the 7-11 to help us and with his limited English and our non-existent Japanese, we got some great ticketS, and we were off to the game! True to the rest of our experiences in Japan, Tokyo Dome is incredibly clean (you could eat off the floor if you were so inclined!) and the fans are incredibly enthusiastic. The Japanese seem to have taken American baseball and added their favorite pieces from American football - a brass band in the stands for each team, and cheerleaders who come onto the field for a pompom-fueled show at the 7th inning stretch. A must-do for a baseball fan visiting Tokyo!! 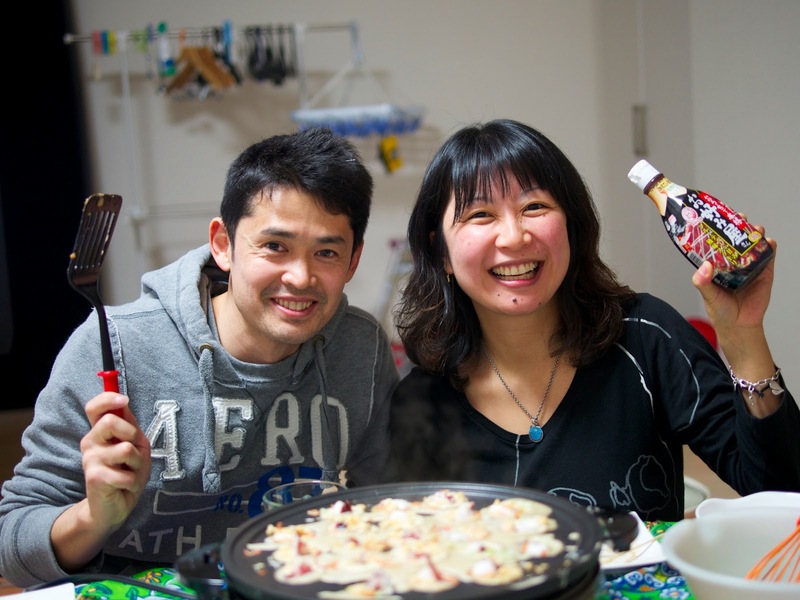 After the game, we went back to our apartment, where our hosts, Yuji and Akiko had prepared for a lovely going-away dinner with us. They had planned on making Okonomiyaki (savory pancakes) and Yakisoba noodles, both made on a hotplate at the dinner table (which is an awesome way to cook with guests, because no one is stuck in the kitchen!). 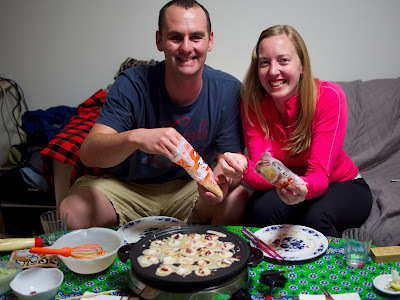 As they were pulling the different hotplate accessories out of the closet to get the right ones, we remarked that they had one for making Takoyaki (octopus pancake balls). Yuji asked, "do you like Takoyaki?" and we said, "oh, yes!" and he grabbed his bike helmet and said, "I will go to the store for octopus! We will also make takoyaki!" and before we could protest (we were just standing in awe), he was gone! Off to the store to procure us an octopus. And when he returned, we had a Japanese home feast! 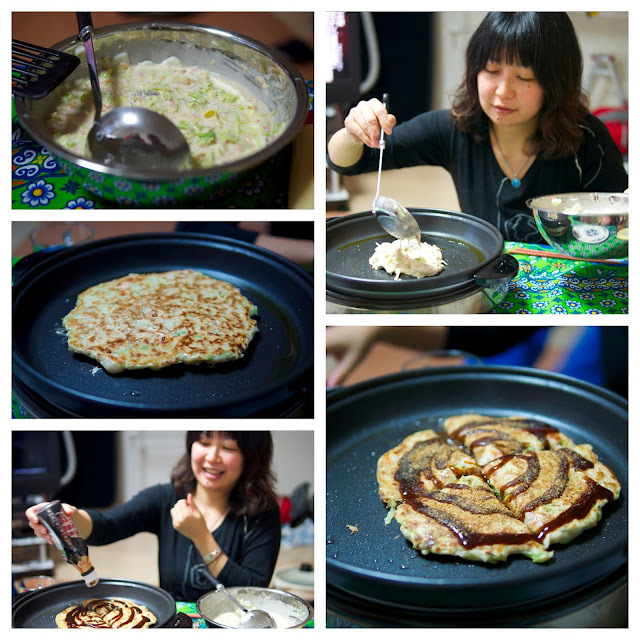 Okonomiyaki with shrimp and pork, and sauces on top, followed by Takoyaki with dried shrimps, crispy rice, and bonito flakes, finished with a plate of yakisoba noodles with pork and green onions. Stuffed to the gills, it was time to teach our hosts how to play dominoes, and after the boys so viciously crushed the girls, it was time for bed, and off to Hong Kong in the morning. Our happy hosts, and wonderful teachers! A note on cost, now that we're at the end of this leg: we had heard over and over how expensive Japan would be, and although it was more costly than our overall trip budget can handle long term, at $210 USD per day, we found that it can be enjoyed on a tight budget. We had several inexpensive days (staying in an apartment through Airbnb.com, renting bikes, visiting museums and heritage sites, and eating in small, casual places) and some more splurgey days (staying in the Ryokans, long train trips out of Tokyo, and souvenir shopping). All in all, we both absolutely loved Japan, are both sad about moving on, and already excited for our next trip back. Between the incredibly friendly and open people, the delicious food, the severe cleanliness of everything, and the fascinating culture and history, Japan was a perfect country to start our world adventure!